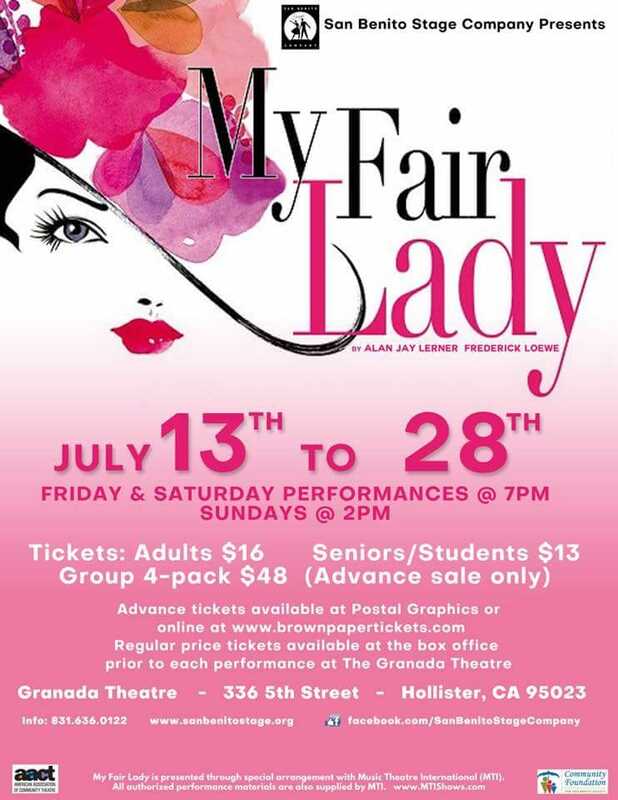 The San Benito Stage Company will make history with its run of “My Fair Lady” starting Friday. The company has never performed the classic musical, and it will be the final show at the Granada Theatre for many of the regular players. 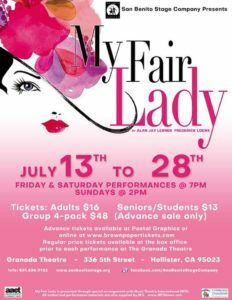 When a stage company committee last year was choosing shows for this season, there had been an emphasis on lesser-known shows, said Derek Barnes, director of “My Fair Lady” and vice president of the stage company nonprofit organization. But that left a void without a known show in the schedule. 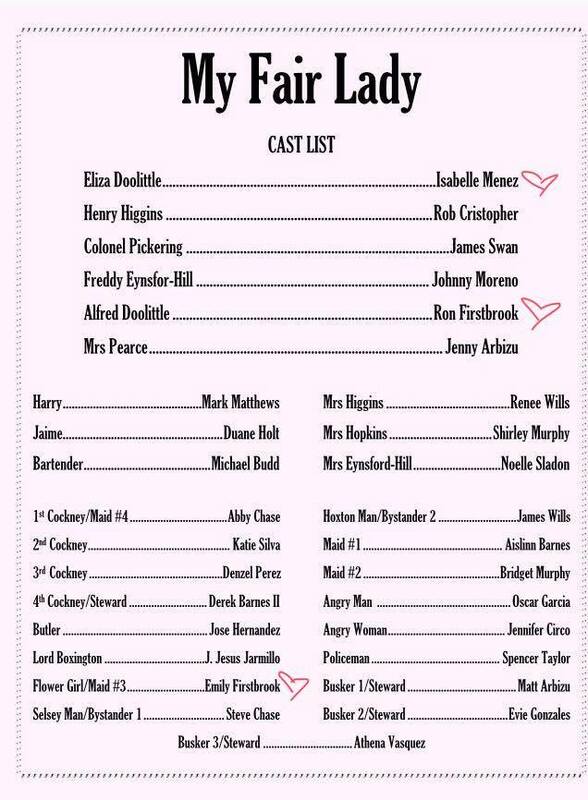 “My Fair Lady” was a natural choice because the group had never performed it. “It’s kind of neat because when we picked it, it hadn’t gone back to Broadway yet,” Barnes said in an interview with San Benito Live. The stage company got the rights shortly before its Broadway revival was announced. “We didn’t have to pay the huge amount of royalties,” Barnes said. It also now provides local theater fans an opportunity to see something that’s on Broadway, but close to home. It’s just one of the reasons locals should consider coming out to the show running today through July 28 at the Granada Theatre, 336 Fifth St.
“If people are looking for a show that’s on Broadway or a show they’ve wanted to see, they have the opportunity now,” Barnes said. There will be a sentimental factor as well in this run because it’s the last adult stage company show scheduled for the Granada and the second-last show overall. There’s a teen performance of the musical “13” later this year to round out the 2018 season for San Benito Stage Company. With renovations scheduled at the Granada, the San Benito Stage Company will no longer use the facility and will instead become a mobile theater group starting in 2019. With Granada owner Andrew Barragan looking to make interior improvements to the historic theater, it wasn’t logistically possible to hold shows there in 2019. Being a mobile theater isn’t completely new for the stage company, though, as the group performed at varying locations for several years before moving into the Granada. Barnes said the stage company has secured the Veterans Memorial Building for a few shows, San Benito High School for some and Sacred Heart as well. “We’ve done our diligence as a board on our end,” he said. Barnes said the nonprofit has had about a year to play for the transition. “We’re very appreciative of the three venues,” he said. Barnes also said it’s going to be “interesting” to work with the new settings with advantages and disadvantages at each. The sentimentality that comes with the change, meanwhile, is one of the reasons San Benito Stage Company brought back an orchestra for this final summer show as opposed to playing track music. 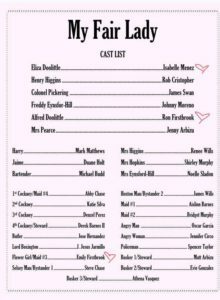 The show includes 28 cast members (see the list attached) and eight or nine technical crew members, he said. Co-directors are Kayla Murphy on vocals and Stephanie Hicks on choreography. Producers are Anne Hall, Suzanne Proctor and Mary Chase. As for the group’s interpretation of the musical based on George Bernard Show’s “Pygmalion,” Barnes said they tried to stay true to the original intent of the script. He said there are some “old school” sexist tones because the male lead Henry Higgins is somewhat chauvinistic, but they try to portray the female lead character Eliza Doolittle as someone who won’t put up with it. Julie Andrews played Dolittle in the Broadway original, and Audrey Hepburn played her in the 1964 film. “So you get the elements of feminism in there that are important,” said Barnes, adding how it’s important in these times with equality under the microscope. Barnes had directed five other shows for the stage company before this one, and said “My Fair Lady” is the most challenging.